In the land of the Great Great Lakes, the Huron settled. 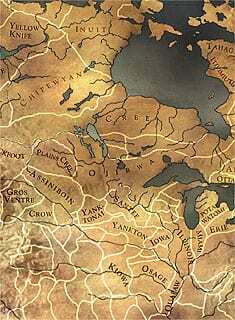 They were concentrated between Lake Simcoe and Georgian Bay in Ontario and were the most successful farmers in what would later become Canada. They arrived during the Paleo-Indian period, about 9,000Ǌ,000 BC, at a time when a glacier bisected Ontario and the Champlain Sea covered the St. Lawrence Valley. 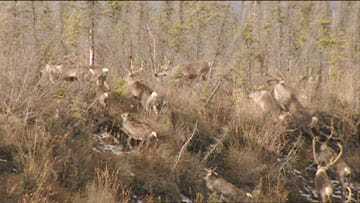 At first, they were a small group that primarily hunted caribou. As the climate warmed and the glacier retreated, the spruce forest became boreal and the Huron, then known as the Wendat, adapted to the changing landscape. They began farming around AD 800 and as a stable agricultural society, their numbers quickly grew. As the caribou herd moved, the first peoples either followed the food or adapted to different diets. 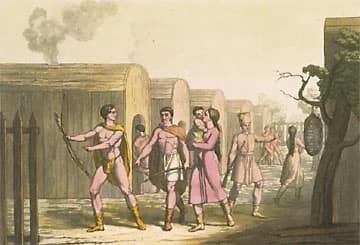 They eventually became a confederacy of 30,000 people called Huronia, living in longhouses that were situated in fortified villages. They had 7,000 acres under cultivation, controlling trade in the area, bartering their produce for fur and meat. The Huron mythology reflects the people's connection to the land and its produce. In one legend, a woman conceives twins who quarrel in her womb. One is born and the other refuses to follow, instead bursting through his mother's side, killing her. She is buried in the earth and from her head grows squash, her breasts become corn and her limbs produce beans. Corn was the most significant agricultural development (though tobacco is arguably more famous). Corn, which doesn't grow in the wild, needs to be cultivated to produce a crop. By the time Europeans arrived, Amerindian farmers had developed 150 varieties of corn, which grew from southern Chile to Ontario. An efficient, ubiquitous crop, it was believed that corn possessed human qualities, even weeping when it failed to grow.